Property Size 1,222 sq. ft.
Durango Colorado vacation rental home known as Durango Rock House. The peaceful setting and convenient location are just the beginning of amenities at this fully-remodeled homestead rock house located in the Animas Valley, just 20 minutes north of Durango, Colorado. The three bedroom, two bath home has much to offer the traveler seeking the comfort, room, seclusion, mountain views plus easy access to Durango and the mountains to the north, including Purgatory Ski Resort. 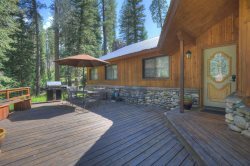 The home is located on a large lot, on what used to be one of the valley ranches north of town, where privacy is evident, and frequent wildlife sightings include deer, elk, black bear, wild turkey, hawks, and other birds of prey. The patio area and living room window views face the open lawn, pasture and mountain views. Inside, comfort is found everywhere, including the living room, complete with vintage rock fireplace, queen size sleeper sofa, large, flat-screen TV and picture window taking in the views. Three bedrooms on the ground level include suite 1 with king size bed and private bath, a second bedroom with queen size bed, and bedroom three with twin bunk beds. A second bath in the hallway, shared by bedrooms two and three, also services the living area. The clothes washer and dryer are located in the home’s basement which is accessed via stairs inside the home. The modern gourmet kitchen with island/counter dining includes a full complement of appliances, including wide-space oven, six-burner gas stove, a warming oven, microwave, gourmet refrigerator and freezer, a full complement of countertop appliances, plus a second sink well serving as prep sink or wet-bar, which includes a wine fridge. Outdoor living space can be found on the East side of the home via a patio which faces the open lawn, pasture area, and views of the rocky cliffs, carved by glaciers long ago. The patio is equipped with a full-size dining table and chairs, gas grill and outdoor space heaters, making a peaceful spot for morning coffee, a full outdoor meal for the whole group, or a comfortable rest stop after the day’s activities. Further enjoyment of the home is facilitated by a large lawn, a seasonal irrigation ditch/ creek, fire pit on back lawn, and open field surrounding the home and lawn for ample space and privacy. Guests should expect to see some variety of wildlife while staying at this home. Two parking spaces are located immediately behind the home, just outside the back door for easy load-in and gear setup, with an additional two parking spaces behind the garage. One garage bay is available for one passenger car, or motorcycles and bicycles, although it is not recommended for large SUVs and trucks. The home is located just about two miles from the famous San Juan Scenic Skyway, including a section known as the Million Dollar Highway, which is an incredibly picturesque driving loop that connects Durango, Mancos, Mesa Verde National Park, Telluride, Ouray, Silverton and Purgatory Resort, as well as many fantastic trails for hiking, mountain biking, fly fishing and other Rocky Mountain adventures. For the cycling enthusiast, the home is located on the main route of the Durango Valley Loop, a very popular road bike ride for locals and visitors which includes a scenic stop at Baker's Bridge, the famous spot where Butch and Sundance jumped into the Animas River to make their getaway in the now classic movie. Baker’s bridge is a three minute car drive and a 1.5 mile bike ride on the pave county road, and a worthy scenic stop. This home is located away from the county road access on a flat, well-maintained gravel private drive, providing a very private and quiet spot to return to after enjoying Durango-area activities, and there are a couple of hiking/biking trails within minutes from the home. Visitors can enjoy the shops, restaurants, galleries and the Durango Train within about a 20 minute drive, with skiing and summer mountain activities at Purgatory Resort a beautifully scenic, twenty-minute drive to the north. Motorcycle enthusiasts will encounter a short, flat, private, gravel lane ride to completely paved roads and the paved San Juan Scenic Byway, which offers a popular scenic drive for motorists of all kinds. Serious road cyclists with find the paved highway north to Purgatory and Silverton to be scenic and challenging routes, and mountain bikers have many choices of trails that allow bikes, and hikers are minutes from a vast array of high mountain hikes. The comfortable Durango Rock House offers much to the traveler seeking a truly special place to call home during their visit to Durango. Contact us with any questions regarding your stay at this cozy and charming Durango getaway. Both Marie and Suzanne were very helpful in finding a property to fit our needs and resolving any issues that came up. thanks to both! It was wonderful, loved the location and scenery from the picture perfect window in the living room every morning. We saw a lot of wildlife, such as wild turkeys, deer, and heard wolves howling one night. Great stay! Our best family vacation rental ever. Everything was super. Everything was quite easy and automated that I never had to work with anyone. My family loved this property and can not wait to stay again next year. We loved the quaint property with the wild turkeys everywhere! We used the fireplace and cooked many wonderful meals in the kitchen. My 2 dogs came with me and they loved it too, had a nice dog run outside. Both Maria and Suzanne were very easy and helpful. Couldn't have been easier. Looking forward to hopefully spending more time at this property next summer. We had very little contact with the team. The Rock House is simply awesome. Our stay could not have been better. VAD very professional and easy to work with. A perfect week of outdoor activities for adults, kids and grandkids. Everyone that I have spoken to or even met, whine setting up this trip, or while actually at the property, was a pleasure to talk to. Everyone had a genuine attitude that the cared for your feeling at home and comfortable with the time you were spending at their place. My stay was great! Very relaxing and peaceful. Team members were polite and nice. I will definitely recommend them to any friend or family. Property was warm, welcoming and very comfortable. The rock house made for a perfect anniversary vacation. All amenities with the property were perfect. The patio was a great spot to grill and watch the wildlife come into the valley every day. Most relaxing vacation in a long time. The house and grounds are perfect. Everything you could possibly want in the house was already here. Very peaceful, will definitely be back.